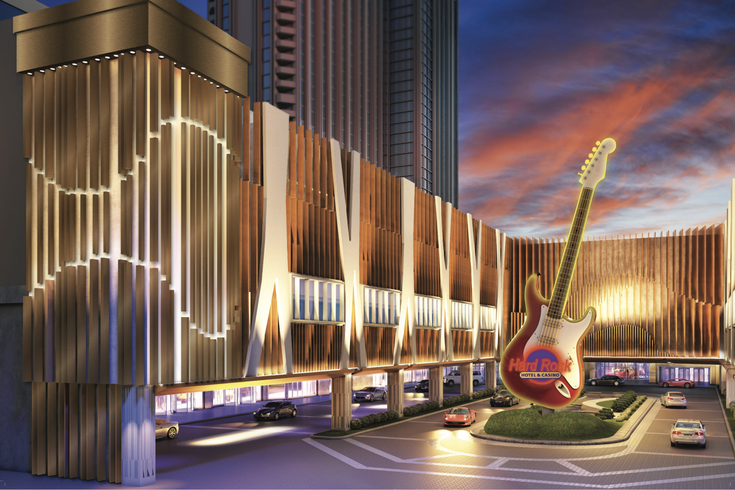 The image above is an architectural rendering of the main entrance driveway at the new Hard Rock Hotel & Casino Atlantic City. It’s been almost a year since the Seminole Tribe of South Florida — which owns the Hard Rock Hotel & Casino brand – announced it had purchased, with two local businessmen, the shuttered Taj Mahal with the intention of spending as much as a half-billion dollars to turn it into a Hard Rock-branded property. So, we thought an update is an order, and Matt Harkness, president of what is officially dubbed Hard Rock Hotel & Casino Atlantic City was kind enough to oblige during a recent phone chat. To answer the obvious first question, an opening date has not yet been fixed. All Harkness would say is that the doors to the adult playpen will swing open sometime this summer. But, he promised, when that happens, visitors will find few reminders of what was, for more than two decades, the flagship of Donald Trump’s Atlantic City gambling empire. “Every inch of the building is going to be completely redone,” said Harkness, who spent 15 years working as a Trump executive in A.C. (including a stint as the CEO of Trump Plaza). “We're going all the way down to the concrete-- in the hotel rooms, the casino floor, the restaurants. It's a complete transformation of the property, including the exterior. People won't recognize the look of the place. “It's going to be completely transformed [and will be] spectacularly beautiful, contemporary, yet comfortable and welcoming to the guests in terms of the presentation. The fit and finish of the property is going to be spectacular. The Hard Rock blueprint — which is built on the concept of celebrating pop and rock music — came into being in 1971 in the original Hard Rock Café in London. According to company history, guitar god Eric Clapton loved the food there so much, he asked the management to hang one of his guitars on the wall as a way to reserve his favorite seat there. Today, Hard Rocks around the globe serve as repositories of memorabilia that cover multiple generations and genres. As such, it’s not surprising that entertainment will play a huge role at Hard Rock Atlantic City. Speaking to city residents at a recent town-hall-style gathering, Jim Allen, CEO of corporate parent Hard Rock International, boasted that the casino will host 200 shows annually. To that end, Harkness noted that the casino’s two main venues, the Mark G. Etess Arena and Xanadu, a much smaller space, are undergoing major makeovers. This is especially good news to those of us who remember the former as a concrete-and-steel acoustical nightmare. In addition to the headliner bookings in the arena and 1,500-seat Xanadu, Harkness said there will also be live entertainment in other spaces within the complex, most notably, it can be assumed, at the relocated Hard Rock Café (which was a Taj mainstay for some 20 years). And speaking of restaurants, Harkness said that the inventory will include both outside operations, including a branch of the iconic White House Sub Shop and Il Mulino New York, a high-end Italian room, both of which did business at the Taj Mahal, and Hard Rock-operated eateries including Kuro, an upscale Japanese spot. The 2,000-plus hotel rooms and suites are being modernized with complete redesigns/rebuilds. And they will offer an amenity unprecedented in Atlantic City: At check-in, guests will be able to “borrow” an electric guitar and headphones through which to play them (thereby avoiding upsetting people in neighboring rooms).